This cookbook arrived on a Friday afternoon sometime in early August. It was absolute perfect timing as some light Shabbos afternoon reading. The sunshine filtered through my window the next morning and I ran out back to our hammock with my sunglasses in hand and this tucked under my arm. I made myself comfortable and spent the next hour reading this book as I would a great novel from front cover to back cover. I pored over the detailed ingredients lists, the gorgeous full sized images, and got to know the author and what inspired her in creating these detailed dishes. That afternoon sticks out in my mind as a relaxed enjoyable afternoon and every time I crack open this book, it comes flooding back to me. Lets start with the author because without one there isn't a book at all. Renee Muller was brought up in Europe in a city called Lugano just across the Swiss-Italian Border from the city of Milan. European cooking embodies a certain amount of elegance and I think she really brings that across well. 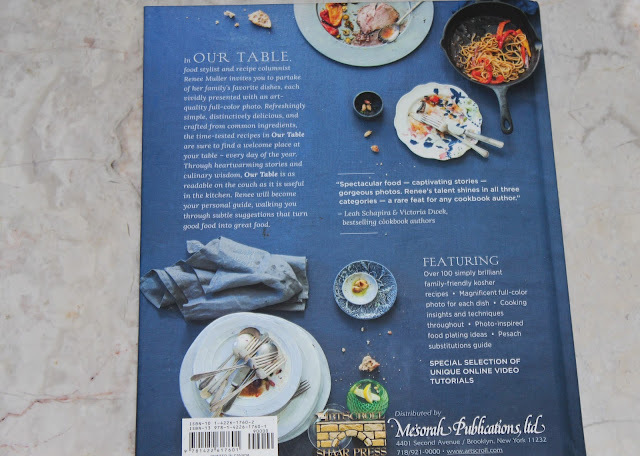 It is her profession as a food stylist that takes her book to a whole other level for me. 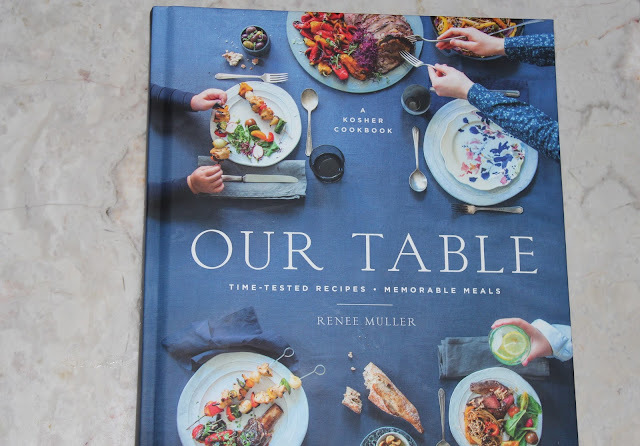 A cookbook may be about those intricate recipes but I am always most impressed by full size, high quality photographs that make you feel like you are right there looking at the scene in front of you. This is what Renee has accomplished here. Every time I take this book down from my shelf, I brush at the cover with my fingers trying to remove those crumbs, only realizing they are in the cover image with a laugh. It's imperfectly perfect! If there were an award for cookbook of the year I'd give it to this one. Is it the kind you'll pull out when cooking dinner every weeknight? Perhaps not. But if you are entertaining guests over Shabbos or Yom Tov you will be pleased to have been able to put together impressive flavorful dishes. Do you own this cookbook? What do you think of it if you do? If not, Our Table is available to be purchased on amazon for $34.99, I highly recommend getting a copy for yourself! And now for the part you've all been waiting for. I personally ordered a second copy to give to one of you, my dear supportive readers! 3. Tag 3 of your instagram friends in the comments by selecting the @ symbol and picking 3 individuals who are not yet already following me there. I will choose 1 winner randomly using a randomizer to keep things fair in 1 week from today on Thursday February 16th,2017 and announce it here on the blog, on twitter and on instagram. The book will be mailed on the day I receive the winners mailing address. Good luck to you all!